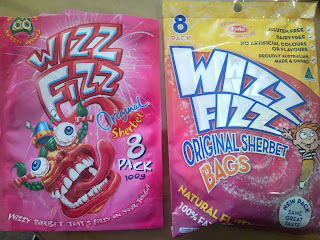 Wizz Fizz - the sugary sherbet treat that comes in single serve packets, each with a little spoon - has undergone a bizarre package redesign that makes it far more conservative and wussy. Yes, believe it or not, that's the OLD pack on the left and the NEW pack on the right. In my experience, kids loved the freaky monster graphics of the most recent packaging. But the new look is tame - the colour scheme is muted, the fonts and graphic elements far less interesting, and the monsters are replaced with lame-looking kids. Why would brand owner Fyna Foods make their product apparently less interesting and exciting for kids? To me, all the clues add up to a ridiculous effort by Fyna to be seen as more "responsible", perhaps under pressure from nutritionists and those who would censor all marketing communications aimed at children (including product packaging). The most telling of these clues is the amount of pack "real estate" - somewhere near 50% - now given over to "health claims". We are now told that Wizz Fizz is 100% fat free, gluten free, dairy free and contains no artificial flavours or colours. Huh? Did anyone ever imagine that Wizz Fizz sherbet contained anything other than sugar, bicarb and citric acid? Do parents really need to be reassured that it contains no fat? Parents of kids with allergies and intolerances to dairy and gluten would already be checking the ingredients list, so why make these claims so prominent? This whole thing smacks of the same "strategy" that has brought Coca-Cola unstuck through its ridiculous and misleading (that's the ACCC, not me) "Mythbusting" advertorials last year featuring Kerry Armstrong. I've still seen nothing that justified Coke's defensive stance in the first place - it was all wrong strategically. Nor can I see any reason why Fyna should be taking the fun out of Wizz Fizz. I completely agree with your comments about the packaging, the monsters were way cooler, but from personal experience as a coeliac (who is also anaphylactic to wheat and gluten) clear labels are really useful. Given the insidious nature of food labelling it's sometimes hard to tell 100 % if a product is gluten free just from reading the ingredients.